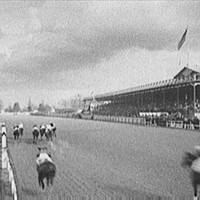 On May 17, 1875, the horse, Aristides, and his rider, Oliver Lewis, crossed the finish line ahead of the rest of the field at the first ever Kentucky Derby. The horse's owner, H.P. McGrath, and a roaring crowd in the stands looked on. What would you have seen in Louisville that first race day?